In the next several months, FPB Cable will be upgrading its telecommunications infrastructure in neighborhoods throughout Frankfort. These upgrades will occur during the timeframes of 7am-3pm or 1am-5am and you may experience a short outage of Cable TV, telephone, or internet. 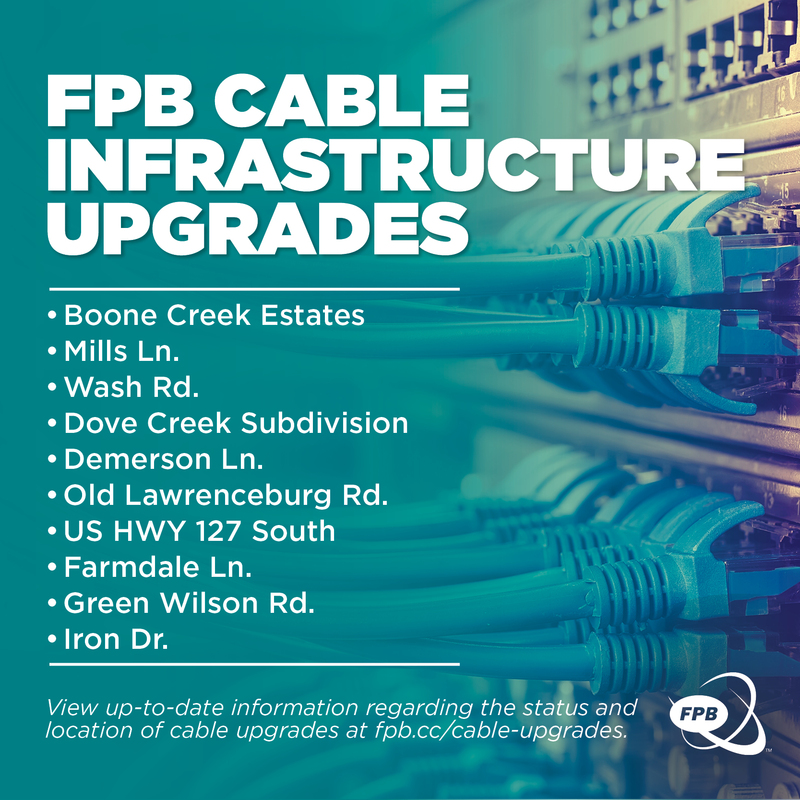 For up-to-date information regarding the status and location of these upgrades, please check this page, fpb.cc/cable-upgrades, or our Facebook page. If you experience technical difficulties outside of the planned outage, please contact FPB Customer Service at 352-4372. Portions of Camp Pleasant Rd. Portions of Waverly Ln. and Georgetown Rd. A portion of Hanly Ln. Portions of Evergreen Rd. and Cardwell Ln. Portions of Rolling Acres Dr.
East side of Capital Avenue, including Old Lawrenceburg Rd. East 2nd, 3rd, and 4th Streets, and all connecting roads in between. Portion of Bald Knob Rd.